The Fourth Industrial Revolution is no longer a story of the big beating the small, but the quick beating the slow. 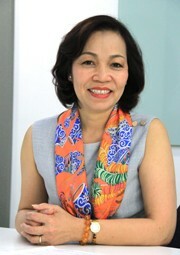 Thus, the opportunity is still shared equally for all businesses, including start-ups, said Ms Ha Thi Thu Thanh, Chairwoman of the Vietnam Association for Women Entrepreneurs and Chairwoman of Deloitte Vietnam, on the sidelines of the World Economic Forum on ASEAN (WEF ASEAN) 2018 held recently in Hanoi. Luong Tuan reports. WEF ASEAN is catching the fancy of the business community, especially the session on Industry 4.0. After this event, will many domestic and international businesses boost their investment in the domestic market in order to catch up with the trend? I think that this event is expected to create great momentum for Vietnamese businesses, hence showing economic development trends and repositioning Vietnamese enterprises to show what they need to change. We believe that they will need more consultancy, including personnel and business strategy consultancy to acquire technology and skills to lay the groundwork for market development if they are confident and motivational enough. What is Vietnam’s role in ASEAN and global value chains? How does Vietnam need to position itself in this picture? The Industrial Revolution 4.0 is taking place globally and it will change economic patterns and picture of all countries and ASEAN is a part. Vietnam has only one choice: Growing stronger with ASEAN to enter the Industry 4.0 era on three main pillars. The Government needs to reform policies and support enterprises in infrastructure investment, particularly connectivity values. Businesses must make full use of connectivity values that the Government has provided to accompany ASEAN countries and their peers in the domestic market. The social community and the business community need to change their perceptions education at school and personnel training in business need to change from technical thinking to skill thinking. In this Industrial Revolution 4.0, where is the opportunity for small businesses and start-ups? Are they capable to compete with bigger ones? I think that the Industrial Revolution 4.0 will bring a fair opportunity for all businesses irrespective of their development level. Small businesses should be confident that they have an equal chance because the Industrial Revolution is no longer a story of the big beating the small, but the quick beating the slow. They should confidently build value connectivity 4.0. Robot is mentioned as a certain replacement for development in the Industrial Revolution 4.0. It will more or less affect our abundant labour force. What should businesses do to meet this development requirement? Robot will be the future. It will replace many manual works done by human beings so far. Thus, it is obvious that people need to change the way they learn in the age of Industrial Revolution 4.0 because all skills developed on creative thinking will be new ones. At the forum, all speakers shared the view that, in the next 20 years, the world will have undergone many changes and the education system and the vocational training system must improve practicality instead of focusing on basic theoretical training. We think that if you still work in the same way as you did before and businesses still develop with the same basic model as before, they will be removed from the game in the next 10 years since technology has replaced all these processes. Thus, vocational training will be the story of applied engineering training to interact with values it creates and social connections. The biggest message of this Industrial Revolution is businesses and individuals need to invest in skills development and skill training on a creative platform.